A "stash of knives and weapons" has been found near the Climate Camp in Kent, police have said. Officers said the weapons, including a knife and a throwing star, were found in a wooded area on the Hoo peninsula on Monday evening. Protesters said the weapons were nothing to do with the camp and accused police of a "smear campaign". 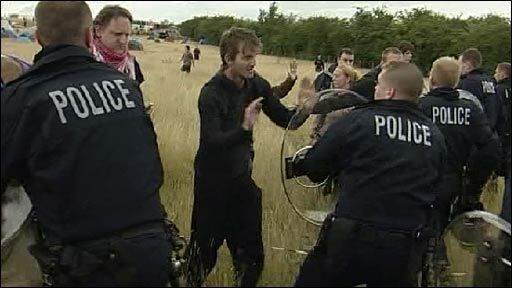 Earlier police and protesters clashed at the site, where about 1,000 people are camped. Twelve people were arrested and seven face charges in connection with the disturbance. Officers said the "stash" near the campsite contained an adapted knife which was found in a tree, a replica throwing star, a knife block containing knives and a large chain with a padlock. Assistant Chief Constable Gary Beautridge said: "There is no justification whatsoever for having these weapons. "I would suggest that a minority of people had hidden them with the intention of causing harm to police officers, and possibly to the horses or dogs that we are using on patrol." He added: "We believe they've been hidden recently; the camp is next door, so an intelligent hypothesis is they may well have been put there by a small group of protestors intent on committing criminal acts to further their aims." However, police said they had no firm evidence the weapons belonged to protesters or were to be used against officers. Protester Simon Evans denied police claims and said: "This is a smear campaign against the camp - an alleged find that has nothing to do with the camp. "We condemn the police in the strongest possible terms for suggesting anyone in the community would use a knife against a police officer. "We are environmentalists and a vegan community. It's just crazy." On Tuesday, the force put on display what they described as "a very small array" of what had been recovered during searches at the camp - property ranging from bolt croppers to knives and fence cutters, and a "War on Terror" board game. "We don't want to stop food going into the site, and we don't want to stop essential material going into the site," said ACC Beautridge. "However, we've got to strike a balance with ensuring that material doesn't go on there and cause a subsequent problem and end up getting somebody seriously hurt or worse." Officers went to the site in Dux Court Road on Monday after asking activists to keep access routes to the field clear. ACC Beautridge said: "It is absolutely essential that ambulances, fire engines and police vehicles can get on and off the site in case of emergency and that the site can be evacuated if the need arises. About 500 activists have gathered on a field about two miles from the power plant in a week-long protest against plans for a coal-fired unit. They want to halt plans by E.ON UK to demolish the existing Kingsnorth plant and replace it with a coal-fired unit which the company claims will be 20% cleaner. Medway Council has approved the scheme and the final decision will be made by the government. If approved, E.ON said the power station would be operational by 2012 and provide energy for 1.5 million homes.